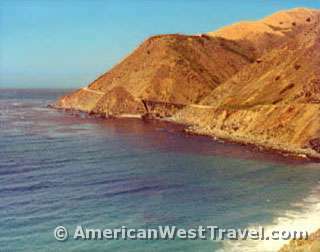 A magnificent vista of the cliffs from the fabled Pacific Coast Highway, California Highway 1. The route hugs the cliffs for over 100 miles from just north of San Simeon (home of the Hearst Castle) to Carmel. 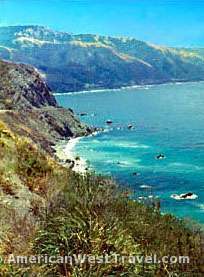 Many people consider the Pacific Coast Highway the most scenic drive in the world and for good reason. It is also one of the most strenuous if you have a motor home or are pulling a camper. The Ragged Point Inn sits atop the cliffs near their southern end. The inn offers an excellent lunch, has great views, plus a trail to the ocean at the foot of the cliffs. A very worthy stop. The coastal cliffs are actually caused by the mountain range diving straight into the ocean. Note how the road is built right into the side of the cliff. Note the golden brown color of the hillside. That color predominates in the summer and fall because little or no rain falls during those seasons. In the winter and spring the hills are lush green. Spring and early summer often offers profuse wildflower displays. 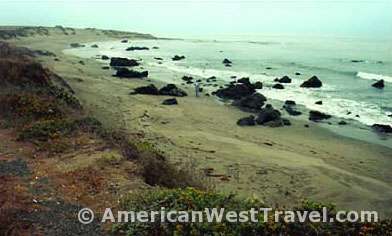 A beautiful stretch of untamed beach near San Simeon. Above left, a solitary gull watches the fog roll in at Pacific Grove on the Monterey Peninsula. Above right, the famous "Lone Cypress" vista on Monterey Peninsula. 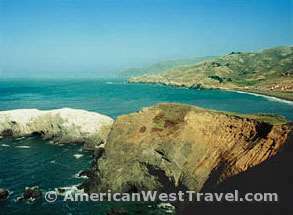 A view of the Marin Headlands just north of the Golden Gate Bridge. 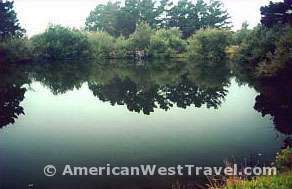 A lush inlet just inland from Pismo Beach.